As Barbie enters its 60th year in manufacturing and distributing its iconic doll, founded by businesswoman Ruth Handler, it has been breaking boundaries and sparking imaginations and now brand owner Mattel, has launched several marketing campaigns and gained support around the world in celebrating its cultural phenomena. 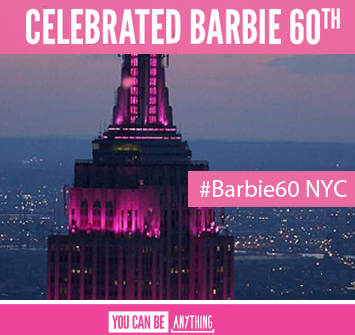 On Barbie’s Birthday on the 9th March, the iconic Empire State building in New York City went pink in honour of #Barbie60. This act reflects the positive respect with which the brand is upheld and the magnitude of support for its success and ability to adapt to changing social norms and expectations over the decades. In fact, reported data from recent years has shown that the brand has gained renewed momentum, with sales figures up 14%! New dolls, of both sexes, now available in a range of body shapes, skin tones, eye and hair colours, fashions and careers has propelled the company’s success. The drive to inspire kids is also key, with limited editions celebrating successful historic women as well as fictional characters such as the first female Dr. Who. In addition to this, the company is embracing further diversity with the launch of its first doll in a wheelchair (available in the UK from August 2019). In celebration of its 60th anniversary and International Women’s Day, Barbie has proudly honoured #MoreRoleModels than ever from around the globe in an effort to inspire more girls. See the details here of the range of dolls produced based on real life successful women ranging from athletes to writers. The brand has also embarked on the ‘The Dream Gap Project’ that aims to give girls the resources and support they need to continue to believe that they can be anything. It stems from research that shows that children pick up on cultural stereotypes at a very young age that suggest women aren’t as smart as men. These stereotypes are often perpetuated by the media and grown-ups who subtly reinforce them. The self-limiting beliefs these stereotypes create can snowball to affect a girl’s trajectory and future career choices. They may even discourage women to pursue prestigious careers, especially in fields that value brilliance. Hence, in conjunction with the brand’s ongoing global initiative to #CloseTheDreamGap, Barbie donated $1 from every doll sold in the U.S. during its 60th celebration to the Barbie Dream Gap Project Fund. This fund will be dedicated to supporting like-minded organizations who are levelling the playing field for girls, while raising awareness to limiting factors that prevent girls from reaching their full potential. Barbie is also pioneering an online Barbie filter to encourage little girls to dream big, believing that this generation of girls will be the last of the firsts. Kids can brand their picture with titles such as ‘First Female UN Secretary’ with the aim of ensuring that girls will never know a role that women haven’t conquered. 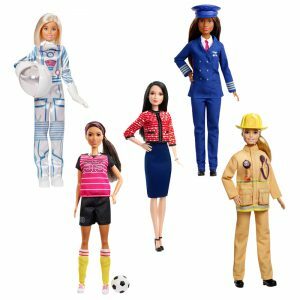 This year the brand has launched an anniversary special collection of career dolls including an astronaut, firefighter, new anchor, pilot, political candidate and athlete – supply is available to registered retailers from wholesaler Baby Brands Direct. Barbie, is a much loved toy brand, with world-wide recognition and positive connotations associated with it and as such a great range for retailers to stock. There will also be heavy marketing online particular through Facebook of its Fashionista collection and Dreamtopia Mermaid range, from the start of Feb through to the end of April. The 60th Anniversary Career range, medical vehicle and helicopter will have digital and facebook spots and the Ken shaving playset press coverage during the first week of April. Log in now for a great range of Barbie dolls including Ken, Chelsea, Skipper, Pets, accessories and a range of playsets and vehicles! Great prices, volume discounts, loyalty credit and a quick dispatch service to trade are all standard at leading wholesaler Baby Brands Direct. Non-account holders can apply for a trade account here.